The genesis of this tool was this shell script found on the Internet that provides similar functionality from the command line. The WhatRoute implementation is in native code rather than via dig as in the script. 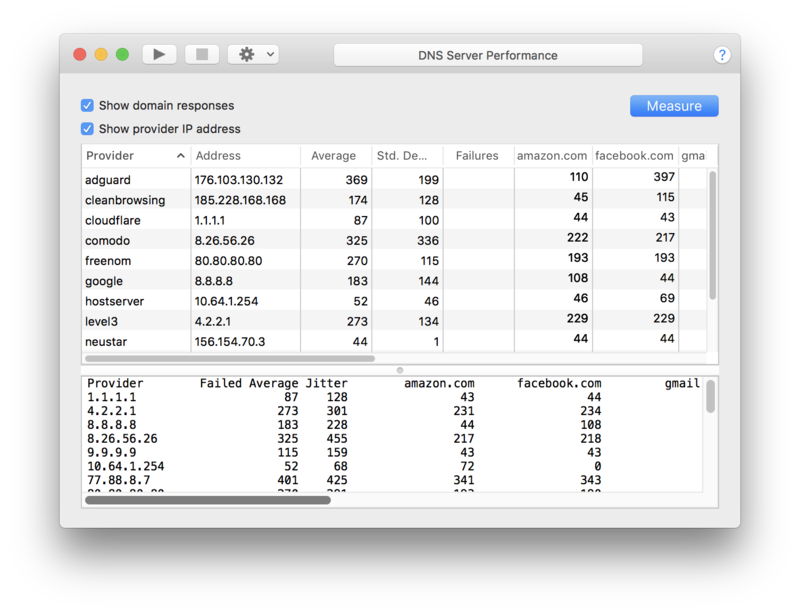 There are many providers offering free (as in beer) access to their DNS servers. There are caveats associated with using these providers but they can offer services such as filtering of obscene content etc. Some guarantee no logging of received queries while others do not make this claim. The downside is that some of them will monitor the DNS queries and sell these results to 3rd parties or provide logs on a regular basis to law enforcement agencies. Ultimately the decision as to which one (if any) you should use is yours alone. This tool may guide you in that decision giving you some indication of the time taken to resolve names to addresses at the various providers. The window is divided into 2 panes. The top pane is table that my be sorted on any of the columns. The columns may also be moved into a different order if you prefer. The data can be exported in CSV format the use of the File/Save command. Right clicking (ctrl-clicking) a Provider name or IP address will reveal a popup menu from which you can send commands to WhatRoute’s main window. i.e. Trace, Ping etc. The lower pane is a text representation of the same data, suitable for copying/pasting into internet forums and email. The pane divider can be dragged to the bottom of the window to display only the table, or to the top of the window to display only the text form. WhatRoute supplies an initial list of open DNS providers and a list of domains to be queried at each provider. IP addresses may be specified as either IPv4 (most common) or as IPv6. A Domain is a simple host name such as you would use in your web browser. The local name servers configured on your Macintosh (probably provide by your ISP if you have made no changes to the default system network setttings) are added to the provider list as hostserver, hostserver-1 etc. Commence measure server responses or stop an existing run. Clear remove any existing measurement data. Restore default Providers restore the lists of Providers and Domains to their default values, overriding any changes you may have made (be careful with this). Edit Providers a list editor in which you can add, remove or modify preovider details. Edit Domains Edit the list of domain/host names to be tested by each resolver. For each server in the Provider list, lookup each of the names from the Domain list and measure the time taken to complete this query. Show the result of each query made to a provider. List the IP address of the providers server, rather than its friendly name.